Coat Easwaran is a spoof programme telecast in Surya TV which is being anchored by Babu Jose. It is slotted at the same time with Ningalkkum Akam Kodeeswaran (NAK) on Asianet. This spoof show is sarcastically called Coat Eswaran (Coat Potta Eswaran), making fun on the word Kodeeswaran (crorepati). Coat Easwaran is being telecast at 8 PM. Asianet and Surya TV are the top most entertaining channels in Kerala. Even though other entertainment channels are bringing up innovative programmes to compete, the television viewers in Kerala keep their hearts close to Asianet and Surya TV. 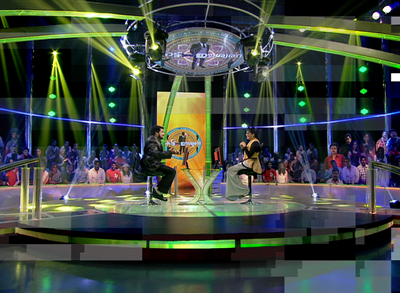 After music reality shows not gathering the interest of the audience, Asianet had tired a different pattern of line. Asianet took a step forward telecasting their prestigious programme Ningalkkum Akam Kodeeswaran (NAK), the Malayalam version of KBC with actor Suresh Gopi as the anchor, it gives a real challenge to other shows aired between the peak time of 8 PM to 9.30 PM. On the other hand, Surya TV was taking time to prepare a Spoof Programme to take on Ningalkkum Akam Kodeeswaran (NAK). This spoof show is sarcastically called Coat Eswaran (Coat Potta Eswaran), making fun on the word Kodeeswaran (crorepati) is being telecast at 8 PM. Thje show is anchored by Babu Jose, a look-alike of actor Suresh Gopi. Way back in 2000 when Kodeeswaran was launched on Sun TV in Tamil, their arch rival Jaya TV came up with a spoof. Surya TV too telecasted a version of Koodeshwaran with Mukesh as the anchor. If Ningalkkum Akam Kodeeswaran (NAK) is a reality show to test the knowledge and memory of the participants,Coat Eswaran is flovoured with fun which could entertain the audience. Even though the rival show would not affect the rating of Ningalkkum Akam Kodeeswaran (NAK), there are possibilities that viewers might change their mind for Coat Eswaran which brings celebrities as guests. Started with Santhosh Pandit, the show could clinch a percentage of spectators on to their side. As both programmes are telecast at the prime time, the channel war has hotted up with arch rivals Asianet and Surya TV ready for a fierce contest to gather eyeballs.